Guinea pigs have an unmistakeable musk, so you can expect a bit of odor when you choose this rodent for a pet. But it doesn't have to be overpowering. Using the right supplies and following proper care guidelines limits odors. Bedding is key to odor control; among its primary purposes is absorbing odors. Regardless of how good your substrate material is, though, you'll have to change it regularly to mitigate odor. While cedar and pine shavings were long valued for their ability to absorb and mask odors, they are now known to pose health risks to guinea pigs and other rodents. Aspen shavings offer the same absorbent qualities without the potential for harm. Pelleted paper bedding is also safe and holds odors in well. 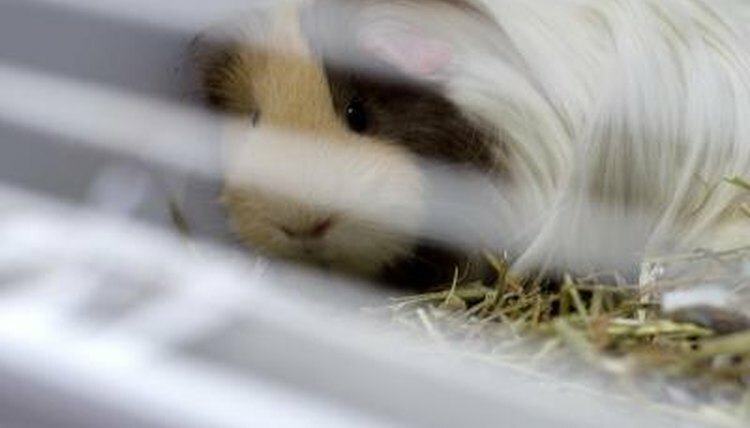 Opt for one of these two materials for your guinea pig's bedding. Guinea pigs require at least 4 square feet of space per animal and should have more space if possible. This ensures they have enough room to move around in while maintaining separate areas for eating, going to the bathroom, playing and sleeping. A larger habitat helps control odors by allowing for more fresh air circulation and facilitating daily cleanup of defined food and bathroom areas. Purchase a cage that has ample natural ventilation to keep bedding odor from becoming concentrated. Wire cages are best in this respect as long as they don't have wire bottoms, which hurt guinea pig feet. If you use an aquarium, use a mesh wire top that provides ventilation. Bedding gets soiled every day. It soaks up urine, sticks to feces and food remnants, and absorbs natural bodily odors. Remove soiled bedding, droppings and leftover food daily. Replace all of the bedding weekly. When you do so, clean the entire cage with warm water and a disinfecting agent. Rinse it completely and dry it fully before putting new bedding in. Control bedding odor by sprinkling a little bit of baking soda along the bottom of the cage before putting in fresh bedding. Baking soda absorbs unpleasant smells well -- that's why many people keep it in their refrigerators. You can litter-train a guinea pig, too. It takes time, patience and consistent efforts; but once it's done, your guinea pigs won't relieve themselves directly in the bedding, reducing a lot of the odor. It will be much easier to completely remove elimination every day.